Sonic the Hedgehog, Ecco the Dolphin, and more. Following yesterday’s announcement that Sega Genesis / Mega Drive Mini will launch worldwide on September 19, Sega has detailed the pricing and first 10 games included with the western edition of the console. Get the details below, via Sega. Q. Which version of the Genesis is the Mini based on? A. It’s based on the original Model 1 Genesis which launched in Oct. 1988 in Japan, Aug. 1989 in North America, and Nov. 1990 everywhere else. A. 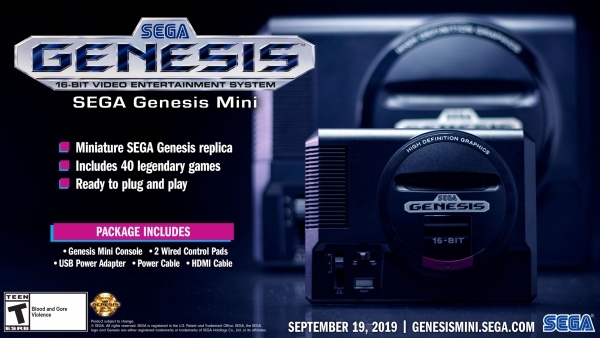 The Genesis Mini comes complete with 40 games, Two replica three-button USB Genesis controllers, One USB to Micro-B power cable, One power adapter (North America only), and One HDMI cable. Q. Can I use original Genesis controllers with the Mini? A. $79.99 US / £69.99 / €79.99 / AUD$139.95. View images of the hardware at the gallery.